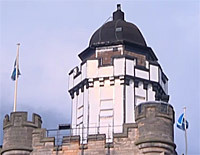 The Edinburgh Camera Obscura (or Outlook Tower) was set up in 1853 by Maria Short, who came from a long line of scientific instrument makers. A popular Victorian entertainment, especially in picturesque areas. The obscura is basically an optical device that creates and inverted image of an outside scene by letting light rays pass through a pinhole into a darkened room. It is like being inside a giant camera that provides living images projected onto a table, creating a 360 deg panorama. Some of the early Victorian lady viewers were terrified of the images produced and were often known to faint at the sight. Other experiences at the site include the Rooftop Experience, World of Illusions, Magic Gallery and Light Fantastic. Back when Canongate was a separate burgh, the late 16th-c tollbooth with its turreted clock tower, was the local civic centre. It currently contains the People's Story Museum which displays a fine collection of Highland dress and tartans. One of the UK's finest castles, perched on a 443 ft high jagged basalt outcrop that dominates the city skyline. 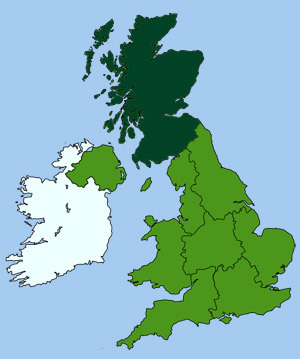 The castle played a key role in Scotland's history right up until the mid 18th-c. Although its ramparts appear impregnable they were once breached by Robert the Bruce's army and then later by Cromwell's forces during the Civil War. 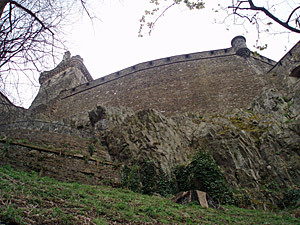 A cannon is fired from the castle walls at 1 pm daily, which is part of a centuries old tradition. The castle's royal apartments include the tiny room where Mary, Queen of Scots, gave birth to the son who succeeded her as king of Scotland, and who then later became James I of England. The great hall, built by King James, exhibits a splendid collection of weapons and armour. The Crown Room displays the Scottish Regalia, comprising the "Honours of Scotland", which are the Crown, the Sceptre and the Sword of State. The world famous Military Tattoo is the highlight of the annual Edinburgh International Festival. The show takes place outside the castle entrance during August, pulling in thousands of visitors from all over the world. 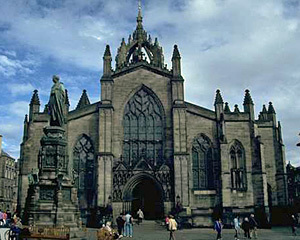 The High Kirk of Edinburgh (St Giles) is Edinburgh's main church. A chapel has stood on this site since the 9th-c. The current building is mainly 14th/15th-c. The magnificent central tower is crowned by a lantern supported on spectacular flying buttresses. Within are many monuments and effigies, including the Chapel of the Order of the Thistle. John Knox is buried in the churchyard, where his statue also stands. Roof-top tours operate regularly during normal opening hours (charges apply). Founded in 1128 by King David I, the abbey is now a picturesque ruin. 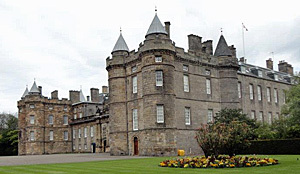 Scotland's finest royal palace was erected next to the Abbey in 1501, by James IV of Scotland. Queen Mary spent six years of her reign here. A major rebuild was made by Charles II in the 16th/17th-c. The palace is open to the public when the Royal Family are not in residence. The state apartments are decorated with Flemish tapestries and many portraits of Scottish kings hang in the Palace picture gallery.